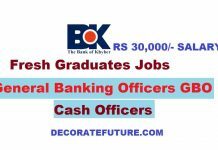 Applications are required for the latest jobs in State Bank Of Pakistan as SBP Officers (OG-1) with no experience required and a salary of Rs 49000/-. 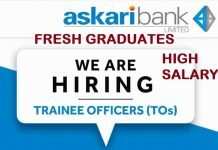 This is a great Career opportunity in State Bank Of Pakistan. The SBP Officer Grade 1 (OG-1) job provides excellent opportunities for the right candidates desirous of building a long-term career in a dynamic organization. SBP Banking Services Corporation (SBP-BSC) was established in 2001 as a wholly owned subsidiary of State Bank of Pakistan. As an operational arm of State Bank, SBP BSC is engaged in managing currency and foreign exchange operations; providing banking services to the government, financial institutions and general public; conducting development finance activities; implementing export refinance scheme; performing agency functions like sale/purchase of prize bonds, prize money draws, national saving instruments schemes etc. SBP BSC, having its Head Office at Karachi, operates through a network of 16 Field Offices across the country. 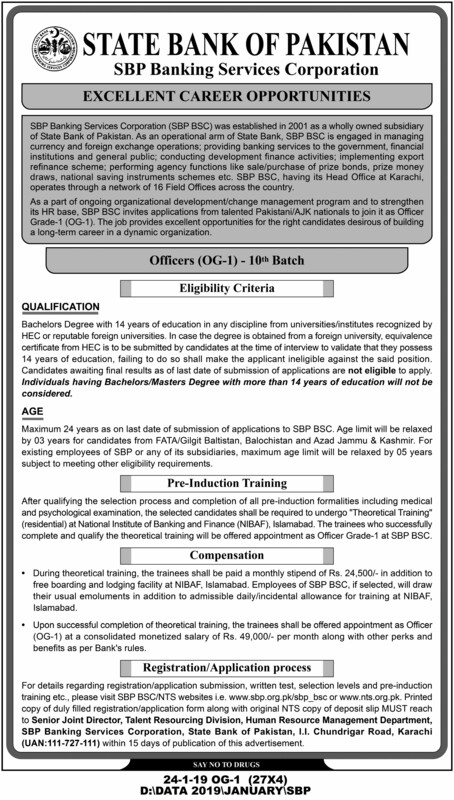 As a part of ongoing organizational development/change management program and to strengthen its HR base, SBP BSC invites applications from talented Pakistani/AJK nationals to join it as SBP Officer Grade-1 (OG-1). Bachelors Degree with 14 years of education in any discipline from universities/institutes recognized by HEC or reputable foreign universities. In case the degree is obtained from a foreign university, equivalence certificate from HEC is to be submitted by candidates at the time of interview to validate that they possess 14 years of education, failing to do so shall make the applicant ineligible against the said position. Candidates awaiting final results as of last date of submission of applications are not eligible to apply. Individuals having a Bachelors/Masters Degree with more than 14 years of education will not be considered. 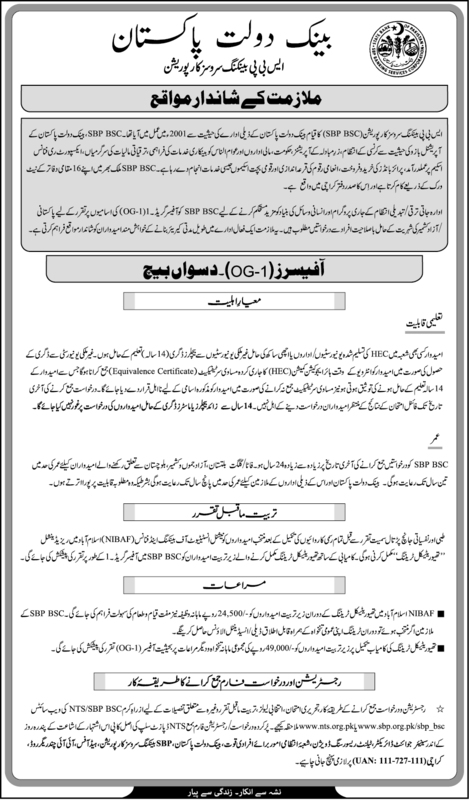 Maximum 24 years as on the last date of submission of applications for SBP Officer Grade 1 (OG-1). Age limit will be relaxed by 03 years for candidates from FATA/Gilgit, Baltistan, Balochistan and Azad Jammu & Kashmir. For existing employees of SBP or any of its subsidiaries, the maximum age limit will be relaxed by 05 years subject to meeting other eligibility requirements. After qualifying the selection process and completion of all pre-induction formalities including medical and psychological examination, the selected candidates shall be required to undergo “Theoretical Training” (residential) at National Institute of Banking and Finance (NIBAF), Islamabad. The trainees who successfully complete and qualify the theoretical training will be offered appointment as Officer Grade-1 at SBP BSC. 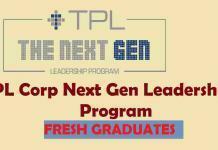 During theoretical training, the trainees shall be paid a monthly stipend of Rs. 24,500/- in addition to free boarding and lodging facility at NIBAF, Islamabad. Employees of SBP BSC, if selected, will draw their usual emoluments in addition to admissible daily/incidental allowance for training at NIBAF, Islamabad. Upon successful completion of theoretical training, the trainees shall be offered an appointment as Officer (OG-1) at a consolidated monetized salary of Rs. 49,000/- per month along with other perks and benefits as per Bank’s rules. 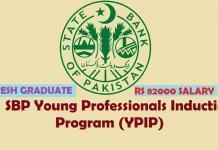 The candidates shortlisted for State Bank Of Pakistan SBP Officer Grade 1 (OG-1) for 10th Batch on the basis of written test and meeting other eligibility criteria will be invited for further selection process. Successful candidates will be selected in order of merit subject to observance of provincial/regional and other quota provisions as prescribed by Government of Pakistan. For Application Form and Deposit Slip Click on “Online Application Form”. Take the print out of Form along with fee deposit slip. Deposit test fee of Rs. 300/- for NTS testing service through deposit slip at any online branch of ABL, MCB, HBL or MBL. Send Application Form along with original NTS copy of deposit slip to Senior Joint Director, Talent Resourcing Division, Human Resource Management Department, SBP Banking Services Corporation, State Bank of Pakistan, Head Office, I. I. Chundrigar Road, Karachi within 15 days of publication of advertisement in press i.e. by March 11, 2019. SBP BSC/NTS will not be responsible for late receipt of applications through post. Applications submitted in person or sent through e-mail will not be entertained. Eligible candidates shall be sent admit cards by NTS at their postal addresses to appear in the written test to be held at designated test centers. SBP BSC/NTS will upload the test results at their respective websites. The test results will also be sent to candidates at their postal addresses.